Dubai, UAE – Being one of the innovative and quality-driven tire brands, ZEETEX knows how important it is to keep the customers satisfied by ensuring their safety and comfort.Keeping that in mind, ZEETEX has launched an online Tire Safety Campaign for both B2B and B2C segments, addressing the key concerns and tips that must be taken care of by the users. 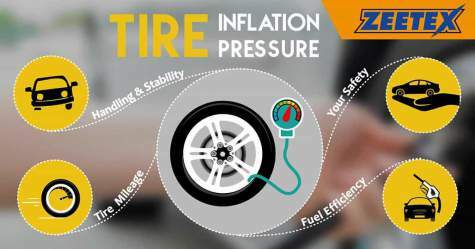 Topics like Tire Inflation, over-inflation, and optimum pressure levels, are covered in the form of text and graphical content. The campaign emphasizes on encouraging the target audience to get the best out of their tires by opting the suggested measures. The time and effort is less, but the benefits are manifold such as, extra mileage, fuel efficiency, vehicle safety and stability, and improved tire life. In retrospect of its achievements in IDIADA and Auto Bild Test, ZEETEX continues to strive forward to do more by creating awareness and helping the customers yield maximum benefits out of ZEETEX Tires.This campaign is a true gesture of being a responsible brand, yielding positive outcomes for the customers, environment, and the overall society.